​Did you know that 300 million tons of plastic are sold each year and that 90% of that is thrown away? Did you know that a huge percentage of those plastics end up in our landfills, our oceans, our wildlife and our bodies? That is why the theme to mark today’s celebration of Earth Day is “End Plastic Pollution”. 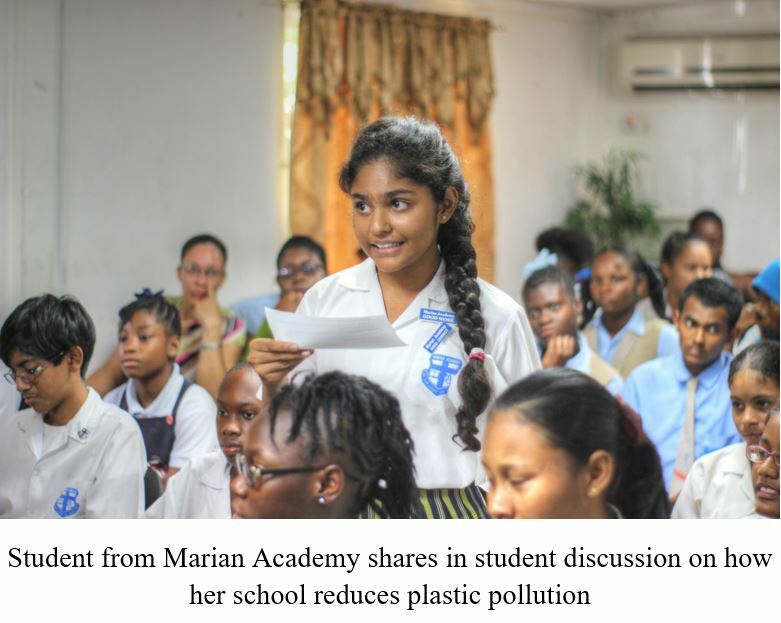 Plastic is a petroleum based product which utilizes approximately 8% of global oil production. Were you aware that the EPA (USA) estimated that five ounces of carbon dioxide are emitted for every ounce of Polyethylene Terephthalate produced (also known as PET is the plastic most commonly used to make water bottles). An increased concentration of carbon dioxide in the atmosphere has resulted in the enhanced greenhouse effect leading to global warming. 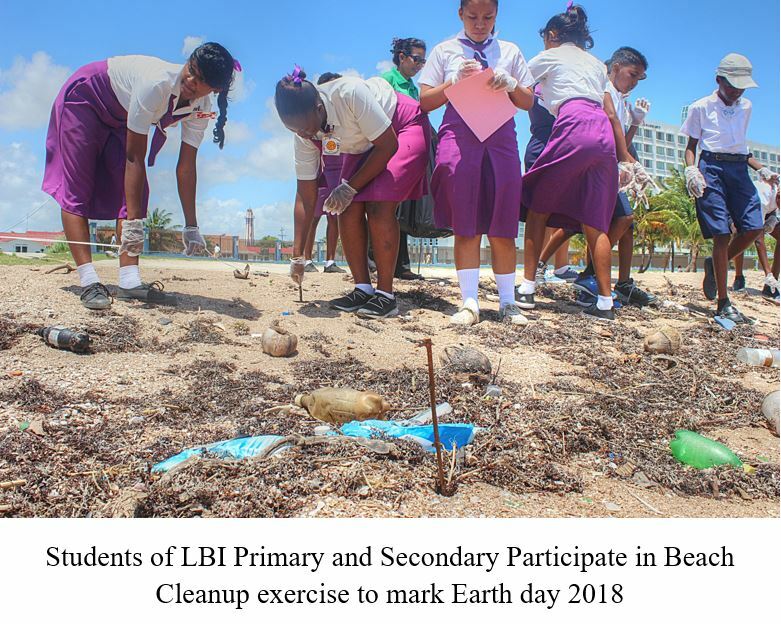 To raise awareness on the harmful effects of plastic pollution and its link to climate change some of the Sandwatch pilot schools teamed up to celebrate Earth Day 2018 through a beach cleanup exercise on Friday April 20, 2018. The UNESCO Sandwatch Programme is part of the Climate Change Education for Sustainable Development (CCESD) programme which was supported through UNESCO and implemented by the National Centre for Educational Resource Development (NCERD) in partnership with local institutions such as the EPA, the University of Guyana and the Mangrove Department, NAREI, Ministry of Agriculture. • 8.3 billion metric tons (9.1 billion US tons) of virgin (non-recycled) plastic has been produced to date. 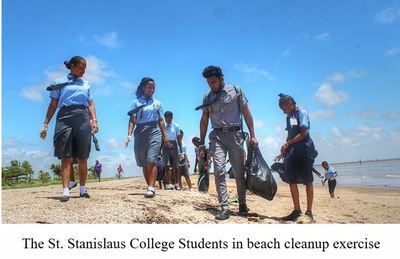 • Generating 6.3 billion metric tons (6.9 billion US tons) of plastic waste. • 9% of that waste has been recycled. • 12% has been incinerated. • The remaining 79% (5.5 billion US tons) of plastic waste has accumulated in landfills and the natural environment. • 12 billion metric tons (13.2 billion US tons) will enter landfills or the environment by 2050 if current production and waste management trends continue.